On 29th October 1955 some aristocrats – six Italian (Umberto Zanotti Bianco, Pietro Paolo Trompeo, Giorgio Bassani, Desideria Pasolini dall’Onda, Elena Croce, Luigi Magnani) and one Italian-American, (Hubert John Edward Dominic Howard) – sat down in the baroque heart of Rome, between the Tiber and Trinità dei Monti, and devised a constitution for an association that would be called Italia Nostra. Their intention was to save a valuable area of the Capital between Piazza di Spagna and Piazza Augusto Imperatore from demolition. Since the seventies, Italia Nostra has also established international relations and founded Europa Nostra, a federation of 220 European associations. They then joined the BEE (Bureau Européen de l’Environnement,) aka EEB (European Environmental Bureau) in Brussels. Following the same cultural intents, one of the Milanese chapters – Italia Nostra Milano Nord – decided to create Boscoincittà (namely Wood in the City) near the San Siro Stadium, on public land granted by the Municipality. Aided by the operators of the CFU, the Urban Forestation Center of Italia Nostra, families, students, scouts, individual citizens have been tirelessly working, planting trees and hoeing, keeping a close eye on the protection of the primary wildlife such as amphibians, birds, reptiles, beetles, mammals … The result now looks like a spontaneous natural environment, but it is in fact the outcome of careful design. Boscoincittà is a gorgeous 120-hectare public park that includes forests, meadows, waterways, wetlands, a pond, a water garden and an orchard. 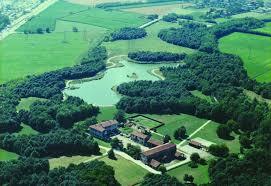 But there’s more than that in Milan. 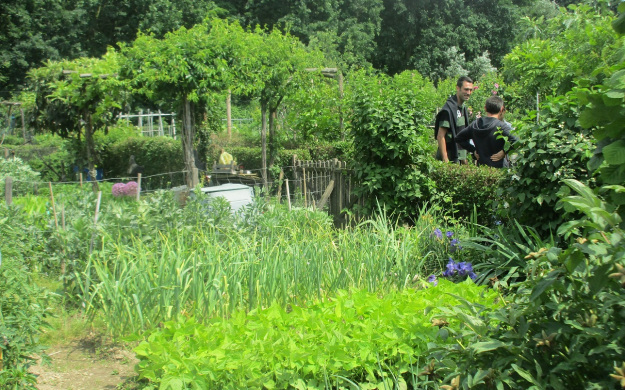 Thanks to several study trips to some of the public parks in Berlin and to the public areas around Amsterdam, the scientific and technical experts of Italia Nostra have noted with interest these cities’ urban structured gardens, organized and run mostly by retired people during their spare time. 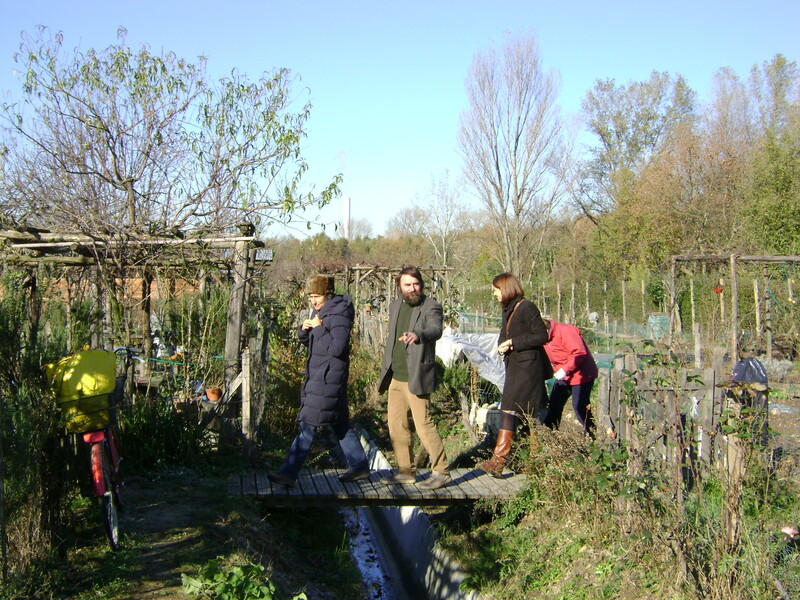 In the second half of the eighties, that same project came into being in Milan: five allotments located in different parts of Boscoincittà were all equipped with irrigation channels. These allotment were subsequently divided into 200 garden lots and assigned to private citizens who cultivate them with great care. After a two-year work period, the group in charge concluded the research with hundreds of questionnaires sent to the Municipalities, followed by inspections in over 600 vegetable gardens. The response was remarkable: 437 forms were completed in detail and 199 more in a more approximate form. The conclusion filled a report of about 350 pages. The data are surprising: in the Metropolitan area the urban gardens extend over 850 hectares (8,500,000 square meters = 9,295,713 yards). In this area there are hundreds of vegetable gardens and orchards, whose origins are often ancient, spontaneous and not regulated by public institutions. The research revealed that these plots no longer serve subsistence needs. Nowadays they increasingly fulfill a social function for the people who tend to them: they enjoy their spare time while exercising outdoors in a healthy environment, develop social relations, and find pride in producing healthy vegetables for the family, or as gifts to friends. The current population of self-made farmers may be aging, but it is getting replaced by a new generation of young men and women. The study also offers an interesting reflection on the assignment criteria (calls) of the plots and on the likely effects of this activity. Municipalities should now deal with the significant presence of vegetable gardens with a view to recovering abandoned areas, for example. Many testimonies from abroad show that creating and sharing green areas can greatly improve social peace (less conflict, more consensus, less violence). Shared green areas are often conducive to the protection of the territory, through the improvement of degraded areas and the fight against illegality. 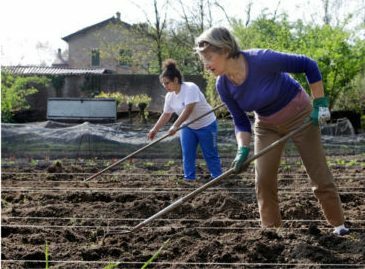 Last but not least, the research has answered another interesting question: “what makes a garden and how much does its produce affect the family budget?” Contrary to what one might think, research has shown that gardens and orchards are not relevant to the budget of the Milanese families. The estimated value of amateur production can meet the needs of about 18 / 20,000 families at the most; and these families, ironically, cannot be counted among the needy ones. All this testifies to an indisputable fact: today the urban population appreciates the comforts and amenities of the city but at the same time longs for more public green and more gardens to put to some practical use, to enjoy as a spot of countryside not far from home. 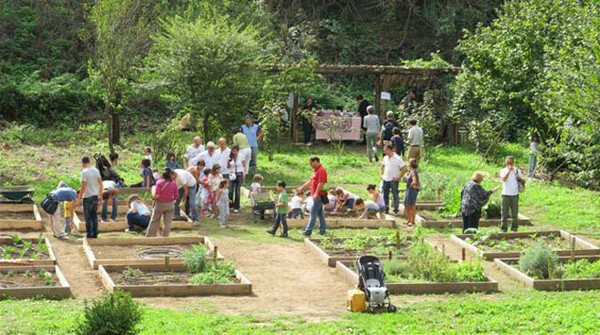 Gardeners with a green thumb who are interested in the assignment of an urban garden at Boscoincittà can get all the information at http://www.boscoincitta.it/orti-urbani-2/ (in Italian) and send the request form from 1st February to 30th March.